Don't worry, this isn't about a giraffe. I managed to go nearly the entire month of April (and now half of May, but who's counting?) without a post April's always a light month for me, both with the sports I follow most closely ending early in the month with the Final Four, and the frenetic pace that is working in higher ed in the month of April. To at least acknowledge that the month existed, I want to at least hit a few highlights. -Carolina won the national championship in men's basketball (Yes, Carolina. Full stop.) South Carolina took home the women's hoops championship. -Wichita State joined the American Athletic Conference, effective July 1, 2017. As a non-football school, they round out the scheduling void that Navy leaves as a football-only school. 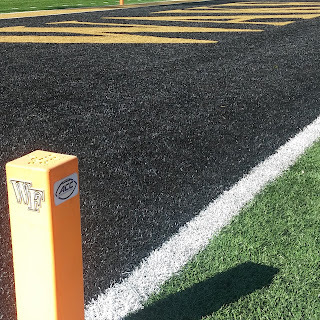 -Starved for football (and a short road trip on a beautiful day), I headed to Wake Forest for their spring game. -My friend Stacey set the record straight when our home state Goldey-Beacom College tried to come for arts education. -The Stanford Band hired a director. Like a real live director, with credentials and everything. Not to be too glib or compare serious situations, but that he comes from supporting Baylor football to directing the Stanford Band is notable. -At a conference for work hosted by Clemson, I got to hear from members of Clemson's national championship football team and Desmond Howard. -And finally, reaching slightly into May, my wife did the Flying Pig half marathon in Cincinnati, which meant I got to head to a Reds game (and proudly wear green and gold in Bearcat country). We now return you to your regularly scheduled programming, which will hopefully be more regularly scheduled.